‘AHAmele is the music ensemble from the Academy of Hawaiian Arts in Oakland. They will perform some of their upbeat hawaiian favorites, incorporating some hawaiian percussion instruments. Their keiki (children) will perform a short set of hula and story, and then they will teach a short hula. 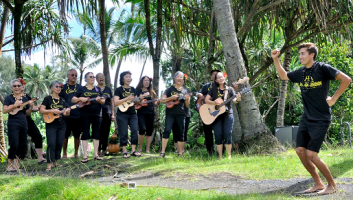 ‘AHAmele incorporate upbeat strums, ipu rhythms, ukulele picking, and sweet vocal singing parts to their Hawaiian music arrangements for a unique sound. ‘AHAmele regularly performs at festivals and other community events, sharing their aloha for Hawaiian music. They are often accompanied by the keiki hula (children) from AHA.